The Pickwick is an old-fashioned pharmacy and lunch counter that's been iconic to the Augusta Road area of Greenville for decades. 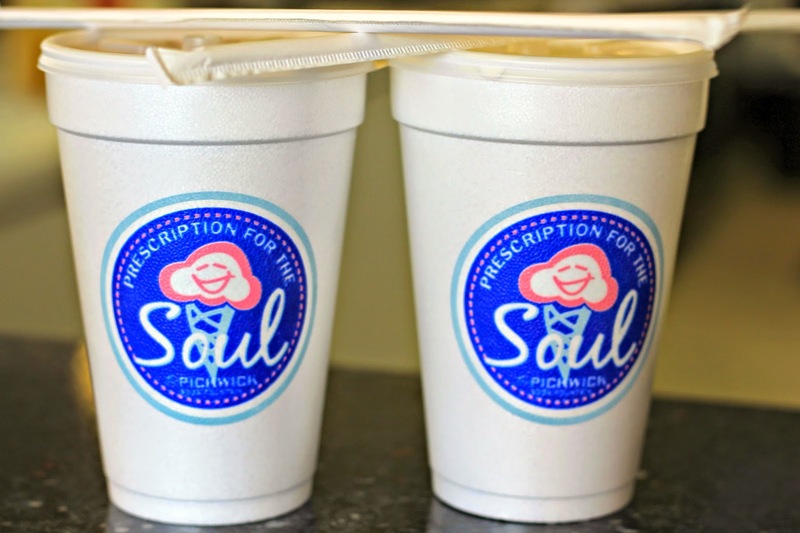 The pharmacy first opened in 1947, but in the 80's decided to close its soda fountain. In 2007, they opened it back up, and restored it to its original beauty. This fall, Food & Wine Magazine wrote an article about the the best soda fountains in the US, and the Pickwick made the list! 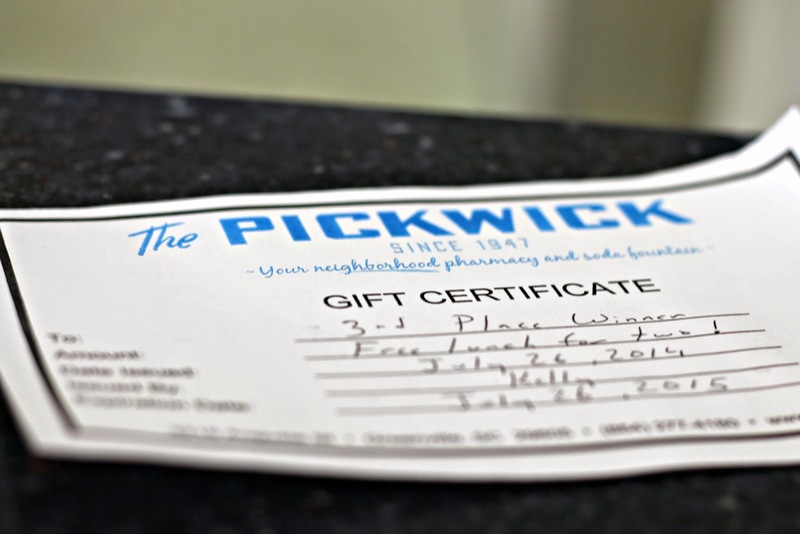 This summer, I spontaneously entered a Tomato Pie contest that the Pickwick Pharmacy was hosting. It was a spur of the moment decision to enter the contest, so I was thrilled to find out that I won third place! My tomato pie has always been a family favorite, but knowing that it placed among other tomato pie enthusiast's recipes was a huge compliment. As part of my 3rd place prize, I received a gift card for free lunch for two at their lunch counter. T and I recently cashed it in, and had our first dining experience at the Pickwick. Their menu is simple, they have classics like Peanut Butter & Jelly, Pimiento Cheese, and Chicken Salad, but they also have a few oddities on their menu like the Cream Cheese & Pineapple sandwich. Still can't wrap my head around that sandwich combo. 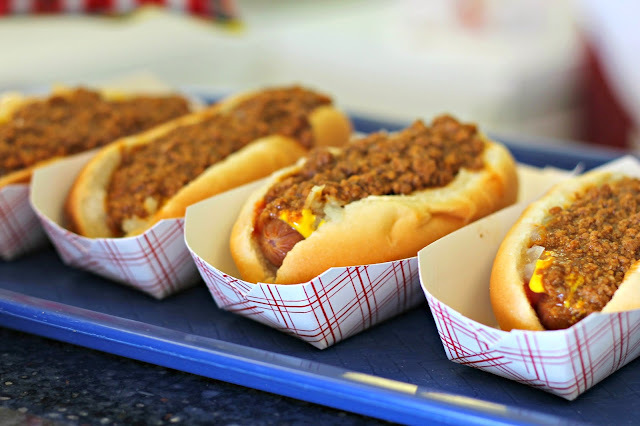 T and I ordered chili dogs and bags of chips, and washed it all down with hand-spun milkshakes. We felt like little kids as we ate our hot dogs and slurped on our shakes at the counter. At no surprise to us, the food was great. When a restaurant has such a simple menu you hope that everything they do offer is fresh and tasty, and the Pickwick did not disappoint. Although it's not quite the season, if you're interested in trying out my Tomato Pie recipe I've included it here for you, as well as a few pictures from that fateful day. I'll also be working to perfect my recipe so that I can enter again next year and hopefully come home with another ribbon! Place cut tomatoes in colander in the sink. Sprinkle with salt and pepper, toss, and allow the tomatoes to drain for at least 10 minutes, up to 2 hours. Layer the pie shell with tomato slices, basil, and onion. In a mixing bowl, combine the grated cheeses and mayo and spread mixture over top. Bake 30 minutes until lightly browned. Cut into slices and serve warm.